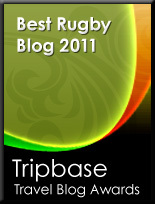 TOTAL FLANKER...a rugby blog: Knockout! Congrats to Sonny Bill Williams who now holds the much-coveted New Zealand Professional Boxing Association heavyweight championship belt after he knocked out American Clarence Tillman in the first round of their title bout. Now, I'm not entirely sure how you become the New Zealand heavyweight champion by beating a rather portly American, but there you go - I'm sure the Klitschko brothers will now be quaking in their boots. I am kind of surprised that SBW's current employers with Waikato allow him to box. In the US, most professional athletes in sports like American Football, Basketball, etc have provisions in their contracts to forbid them from doing potentially dangerous sports, and if they did those activities and got hurt, it would make their contracts null and void. Is this the norm for rugby players in England and the Magner's League as well? Are Wales really that good?